Monsters Inc blew more than a few minds when it premiered in 2001. Sully's coat comprised a million rendered hairs, and Boo's oversized pink shirt moved with such a natural flow it appeared nearly life-like to audiences. And while advances in technology during the twelve years between the original film and the prequel—premiering in June—will provide another jaw-dropping visual experience, Monsters University was no less challenging to make. Here's an inside look at how everyone's favorite animation house makes its movie magic. The process of creating Monsters University began over four years ago with the near-simultaneous development of its script and storyboards—the cornerstones of the movie's plot. Through months of continuous brainstorming and idea-pitching between producer Kori Rae, director Dan Scanlon, story supervisor Kelsey Mann, and their respective teams as they react to and develop the various devices and subplots of the story, the production team relies on in-house designed storyboarding software called Pitch Doctor. This Wacom-tablet controlled sketching program allows storyboard artists to rapidly produce and pitch story elements and scenes—more than 227,246 such pitch drawings were used to create the blueprints for MU. While the writers and story artists are busy nailing down the overarching plot points, character and set designers are busy imagining what this universe would actually look like. In addition to Mike and Sully and other primary characters, MU designers invented another 300 background characters based on six basic body types, called Fungus, Slugs, Charlie, Block, Spiff, and Pill. 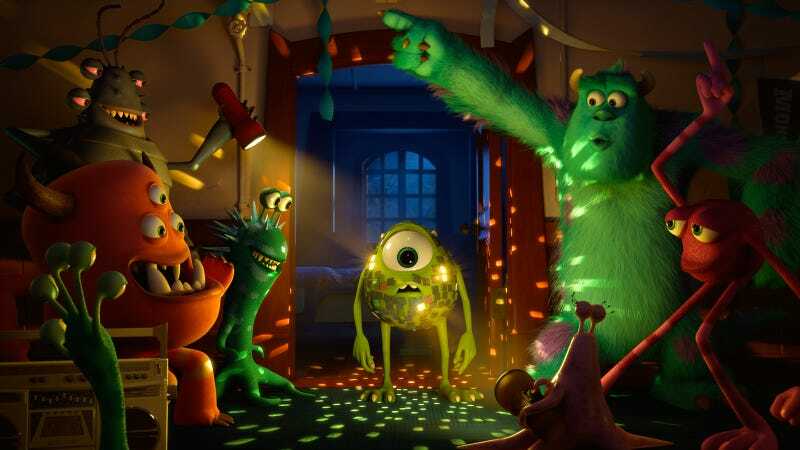 These background characters were based loosely on those from the original film, with the addition of varying numbers of appendages and growths—an average of 3.7 eyes, 6.2 limbs, 5.4 horns, and four claws per monster. Many of the characters in the film were heavily influenced by real animals. The Helen Mirren-voiced Dean Hardscrabble, for example, was created by mixing the head of a horned lizard with the wings of a bat and lower half of a millipede. Set designers, meanwhile, spend their days creating the "style and feel of the campus, specific to the Monsters world," as Robert Kondo, Sets Art Director, explained. An immense amount of consideration went into the architectural design of the movie's buildings, taking into account issues of scale and ability. "Monsters come in all sorts of different sizes—both big and small," explained Kondo. So designers took great pains to incorporate architectural features necessary for that universe—doors within doors, for example—that would allow monsters of any size easy entry. Their various aerial and aquatic abilities were taken into account as well, with the incorporation of underwater and window entrances. And if you squint your eyes just right, you'll notice that the buildings on campus bear a striking resemblance to the monsters they contain. One nice thing about Monsters University versus Monsters Inc is that the campus needs a lot of vegetation so we got to play a bit more with what the vegetation looks like in MU. You can see we took that the same sort of idea of finding horns and things in the architecture, but we also wanted to take the ivy and integrate it with this idea of [buildings' faces], so it makes sort of this tentacled monster on the front of the building. Once the storyline solidifies, the storyboards are slowly converted into the film's basic animation. Emphasis on slow. "Watching an animator work in real time would be like watching paint dry," Scott Clark, the film's Supervising Animator joked. "It takes a long time to animate. It takes weeks to do second's worth of work." That's why the studio leveraged the talents of a small army of artists—70 at the peak of production—working on a proprietary Linux-run animation software platform known as Presto, which reportedly operates much like the commercially available Maya. These models have every joint in their skeleton that we have in ours. Well, Sully has a tail. And he has one fewer finger than we do. And he only has three toes. But he's got a lot of the same things we have...I can go into the spreadsheet here and I can pull up pieces of his model—like here is his tail and all of the controls for his tail—I can move the value back and forth and the tail moves around. Each row of the spreadsheet, which tracks a single element's position over the 129,000 frames that constitute the 90 minute film, can also be displayed in graphic view, which closely resembles the EKG from an internist's nightmares. It's a stack of line charts, hundreds of jagged overlapping sine waves, each denoting the sway of a single body part at any given moment. Once the baseline animation for a scene is finished, the frame's fine details are rendered. This includes character elements, vegetation, elementals like water or fire, bags, ropes, and book pages. With over 400 different characters—an average of 25 per shot—Monsters University required 100 million computer hours to generate. That's 29 hours per frame performed at Pixar's on-campus processor farm in Emeryville, CA. With the use of global illumination algorithms, which auto-populates hundreds of lighting effects per scene based on real physics, and a revamped simulation engine, Pixar is able to create strikingly realistic characters. Sully's fur alone has seen a five-fold increase in volume since the last film with a total of 5.5 million hairs. The finished film is then reviewed, packaged, and shipped to theaters where it is slated to open June 21st. We received a sneak peek of the first 40 minutes of the film (the second half was still in rendering) during a recent tour of the studio. Rest assured, this franchise will once again have you screaming—in delight.